Hello, minna-san. Been awhile without a wallie. Here's a new one from me. A TRC wallpaper. After I cleaned the image and tried to get rid of the original bg, an idea came across my mind. Why not put the ori bg too in the wall? Then the rest you can see on the wallie. (p/s: It's really took me 4hrs + to 'rearrange' the bg. Some of it I just brush and smudge around). Reason for giving the title: Just listen to Scorpion's 'You and I.' You get what I mean. Well, it's been a while since I've last seen any work from ya my friend. First off, I think the idea is nice. Though I can't say this is your best piece. It's the grass that I'm really noticing. You need to make it more realistic. Grass isn't normally a lime-green color. If you fixed that up by making it darker to make it look more realistic it'd be a great piece. Anyway, it's a fine piece overall. So keep it up aye? I think u may wana work on the grass a little bit..
but overall... look reasonable, nice work! 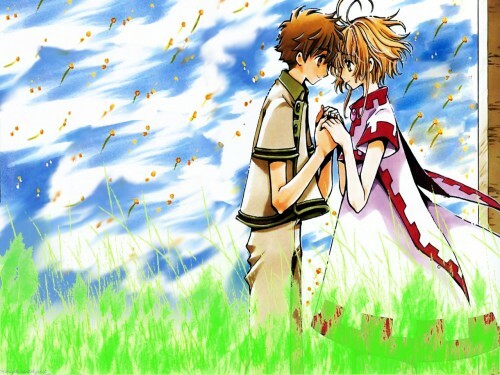 Both Syaoran and Sakura are so cute and sweet together!